One windy October night in 2001, I heard a newscast about how the terrorists might be planning to attack a mall on Halloween. Thinking about how we humans, with our wild imaginations, can scare ourselves sillier than anyone else can, I stepped outside to clear my head. Cracklety-clack, bones in a sack. They could be yours–if you look back. A boy walked home with a heavy load. That much was a gift. But then I had to figure out, who was the boy? What was he carrying? What was the story? It took years to come together–after I had my own lost-in-the-woods-at-night experience! Oh, Nancy, I SO want to hear about that lost-in-the-woods-at-night experience! And I so love how just a sound, a sound, was the start of On a Windy Night. Thanks so much for the inspiration! And P.S. you’ll find more good stuff where that came from over at Nancy’s place (or her website, to put it another way). What a great post from two of my favorite writer-gals! 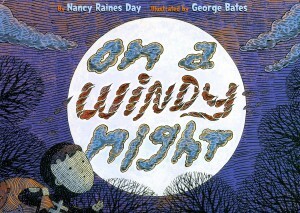 The refrain in Nancy’s WINDY NIGHT I’ve loved since the first time I read it. The book bursts with spooky fun, and a masterful hand invisibly behind the words. Thanks for sharing! I love the rhythm of that rhyming refrain. That Nancy’s genius! What a neat post! it’s so fun to see how creative people can turn one thought into a great picture book. Not to mention, it’s comforting to discover that sometimes it takes them years to do it. Thanks, Cath! Fun post! I appreciate Nancy’s process because I’m working on a PB based around sounds. Love how a sound and rhythm give way to a stanza and character, when we allow our imagination free reign. How stifling we can be sometimes! Thanks for the encouragement. You’re so welcome, Joanna! Thanks for stopping by. Fun! I love this post and am going to look for Nancy’s book – today!